I don’t think it is an exaggeration to say that James Talmage’s Jesus the Christ (hereafter JTC) enjoys quasi-canonical status in the church. This fact makes many of my biblical studies friends cringe, because Elder Talmage’s work reflects one-hundred-year-old scholarship–with all of its limitations and biases. Richard Holzapfel and Thomas Wayment have written a study guide that attempts to bring modern scholarship, revelation, and sensibilities to the reader of JTC. After a brief introduction which explains their purpose, they devote one short chapter to each chapter of JTC. These chapters discuss advances in biblical scholarship, new LDS revelations, and also devote quite a bit of time to the Joseph Smith Translation and other teachings from Joseph Smith which were not available to Elder Talmage. They conclude each chapter with a few study questions. (I found the study questions pretty anodyne, although a few were thought-provoking.) While carefully honoring Elder Talmage at every turn, Holzapfel and Wayment are clearly more comfortable with ambiguity and less-than-perfect disciples than Talmage was. If the reader expects everything in JTC which is problematic to be addressed in the study guide, she will be disappointed. For example, Elder Talmage makes reference to Job 19:25 as an example of a prophecy of Jesus, but this is an extremely unlikely reading of that text; Holzapfel and Wayment don’t address it. At another point, JTC argues that Matthew, Mark, and Luke had no knowledge of each other’s texts; no modern scholar believes this; again, the study guide does not address it. In another instance, JTC argues that Peter was not “unlettered” and was “well-to-do;” I don’t think most scholars would agree with that characterization (in fact, Mark seems to suggest precisely the opposite). While the study guide covers many of the issues in JTC to which a modern scholar would object, the reader should not therefore assume that everything problematic in JTC has been addressed. Further, while the study guide does a good job in correcting now-dated observations, it does not provide to the reader any of the new insights of biblical scholarship. I realize that there are space limitations, but I’d hate for someone to read JTC and the study guide and feel that she now had had an introduction to modern scholarship. This would be akin to someone reading a geocentric textbook and then a pamphlet correcting it–but who hadn’t had a heliocentric model explained to him. Sure, he won’t believe the geocentric model anymore, but he has no idea of the new knowledge that is out there, its uses or its implications. Something as simple as suggested sources for further study at the end of the book or a few pages explaining the major trendlines of 20th- and early-21st- century New Testament scholarship would have been enormously helpful here. I also noticed some editing infelicities in this book. At one point, they date the Talmud to the 4th and 5th centuries (xvi), but at another point date it to the 6th or 7th centuries (p30). Material about Peter as the rock (p103) appears in the chapter on the Transfiguration when it properly belongs in the previous chapter. At least one of the study questions seemed attached to the wrong chapter. And I believe the authors introduced a few errors of their own. And while biblical scholars are notorious for disagreeing, there are a few of what I would consider errors here. For example, at one point they write that Matthew was the only Gospel writer to gather parables together (p87), but Mark did the same. Later, they claim that no ancient manuscript has “rope” instead of “camel” (p124) in Jesus’ statement about a camel going through the eye of a needle, but this is not the case (see Metzger, A Textual Commentary on the Greek New Testament, p40). I also wonder about the reader’s experience of working through JTC and the study guide. While Holzapfel and Wayment are extremely deferential to Elder Talmage and exceptionally subtle in their corrections of his work, it is nonetheless the case that virtually every page of the study guide remedies a flaw in JTC. So imagine a 19-year-old missionary reading JTC and then the study guide. She reads JTC and the study guide says, in effect if certainly not in tone, “Elder Talmage was wrong. An apostle was wrong. Wrong again. Wrong over here. Wrong about this as well.” And while the approach of the authors is to frame Elder Talmage’s work as not wrong but simply limited by his historical circumstances, there are many instances in the book–such as changing interpretations of Eve’s role in the Fall–where real doctrinal shifts in LDS thought in the last century become obvious. I suppose your sensibilities regarding the proper level of obedience to authority and attitudes toward (de facto) infallibility will determine whether you think this reading experience is a good one or a poor one for our missionary to have. And despite Holzapfel and Wayment’s gentle correction, I would still be uncomfortable recommending that someone read JTC. Elder Talmage wrote before the Holocaust made the full price of anti-semitic biblical interpretation clear; his references to “wicked Jews” are, by modern standards, troubling. Also uncomfortable are his racially-tinged remarks about Native Americans. The study guide addresses attitudes toward the Jews, but I wonder if it is enough to counter-act what Elder Talmage writes and to justify exposing a new generation to these ideas. Also, JTC has the tendency common to its day of embroidering upon the biblical record by fleshing out details and suggesting motives and attitudes for various characters (“Mary’s sensitive nature was pained” — no gospel account says anything about the nature or emotional state of the woman who anointed Jesus), which, I think, makes it hard for the reader to avoid importing these extremely speculative details to further readings. These reasons might weigh in favor of allowing JTC to quietly retire. Of course, my question here presumes that you can wave your magic wand and retire JTC. If you can’t, the study guide’s mission is amply justified. I also confess that I found something lovely about the idea of the study guide: instead of Holzapfel and Wayment arguing that JTC is past its sell-by date and the only thing left for it is the recycling bin, they instead chose to, in a sense, redeem the text by bringing it up to date. I imagine that if Elder Talmage were still alive, he would have done precisely the same thing in the wake of new discoveries, beliefs, and revelations. It is a lovely tribute to him and I love how they model respect for his apostolic office with a willingness to correct his work. So: there are better books to read about Jesus than JTC. 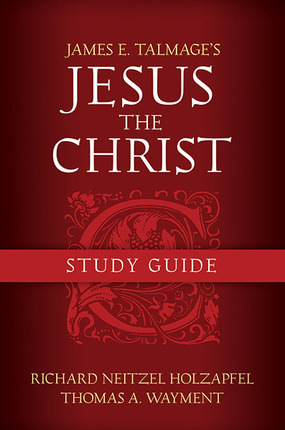 But if you are going to read JTC, you should read it with this study guide in hand. The publisher provided me with a review copy of this book. I must be one of those rare life time members who never read JTC, even though it was on the shelves in my parents house, and my brother and dad both served full time missions, I believe it was required reading for my brothers mission in the 80’s. After your review – I will continue to fast from JTC. Thanks for all of your typing and teaching. I think the existence of this book shows why still having it, un-annotated, in the Missionary Library is extremely problematic. Could you continue your list of book recommendations for the New Testament? Our stake presidency has made it a goal for the entire stake to read JTC before our next stake conference. The stake institute (gospel inspirtainment rather than study) is giving weekly presentations on JTC. There are other stake emphases on JTC this year. I was surprised when this was announced since I think JTC is too old-fashioned for the general reader to read with much pleasure or profit, but I think that same old-fashioned writing will prevent most readers from even realizing that significant doctrinal points have greatly shifted. It’s just an odd choice all around. JTC is verbose and redundant. No, I don’t think JTC is going away for a long time. Far from “quietly fading away,” I imagine it will hold its place as a standard in the “missionary reference library” for quite some time. I agree it is verbose and dated, but I also think that Talmage’s pseudo-academic approach can serve – for many a young missionary – as an initiation into the world of deeper, more reflective scripture study that includes seeking out scholarly insights through secondary source reading. As quasi-cannon, it can be a safe – if flawed – springboard to more serious study. And yes(!!) I do think it’s helpful to have a (Deseret Book published) volume that gently but unambiguously corrects and reframes some portion of the myriad missteps in JTC. I recall being in the MTC and talking about BoM geography. When I brought up the limited geography theory, I was shocked at how quickly the conversation heated up, with several of the other missionaries in my district citing Talmage’s JTC passages on the hemispheric model as the final word on the topic. We have plenty of voices reminding us of the importance of obedience and sustaining those in authority. What I like about the concept of this book is that it helps remind us that obedience and support should not compel us to think our leaders infallible. Missionaries and members alike can stand to be reminded a bit more often that even our latter-day prophets and apostles are just learning line upon line; seeing only in part, through a glass darkly. My personal choice for those 700 pages is An Introduction to the New Testament by Raymond E. Brown. It’s a “faithful” introduction (part of the Anchor Yale Bible Reference Library) to the NT, and I turn to it constantly. The last century’s advances in bible scholarship are akin to a shift from geocentric cosmology to heliocentric? What was the old center and what is the new one? John Mansfield, you are over-reading my analogy. That said, if I had to force it, I would say that Elder Talmage writes from a center where you try to harmonize the four accounts into one harmony whereas the new center is emphasizing the distinct voice of each writer. This is fascinating, Julie. On the one hand, the fact that this book is still in the mission library and frequently read by Mormons (as evidenced by Ardis’s comment) makes me think something like this book is necessary. On the other hand, I also worry, with you, that such a study guide only prolongs a book’s life that should probably be cut shorter. JTC is a vicious hatefilled screed against mainstream Christianity. After reading it I will never believe that LDS do not attack other religions. Nan Trott, that’s completely inaccurate. One thing that Holzapfel and Wayment repeatedly point out is that Elder Talmage (over)relied on 19th century mainstream Protestant scholarship–to, I would add, the detriment of his treatment of Catholicism and Judaism. But he’s not attacking mainstream Christianity. Given that mainstream Christianity holds many of the same tenants as Catholicism I disagree, still in all it is a hateful book and I am still left seeing a church that attacks other faiths. If this was a book that HAD quietly faded away I would have a different outlook. As long as JTC is a book that many LDS read and recommend, keeping it the forefront, the LDS church is attacking others. That kind of extremely broad generalization verges on trollish behavior. One 100-yr-old book defines the current LDS Church? Where is our big publishing arm’s ‘Truth about the Catholics” volume? Our anti-Muslim volumes? Our anti-cult volumes? Where are the LDS counter-cult ministries decrying the Satanic evils of (fill in the blank) and their power to steal our children? Where is the LDS equivalent of Jack Chick tracts? How about Joseph Smith’s positive statements about Catholicism? Nan thinks that Talmage is a hate-filled screed? Since he evidently relied so heavily on the Anglican cleric Frederic Farrar’s Life of Christ (1874), should we make a case that Farrar’s book was also a hate-filled screed against mainstream Christianity? Thanks for the giggle, Nan; sometimes a little comedy is just the thing for a rainy December day. Matt, after reading _Jesus Christ and the World of the NT_, I’d recommend an intro to the NT. I admit that I haven’t really kept up on the “Introduction to the NT” books, but I like Raymond Brown, Bart Ehrman, Pheme Perkins, Ben Witherington, and Luke Timothy Johnson from their other writings, so I suspect that any of their intro books would suffice. But definitely read an “intro to the NT” book. Also, I’d suggest that people pick up an NRSV study bible–either Oxford or Harper Collins–and read the text and the notes. Next step: pick one NT book and read a commentary on it. It’s hard to make blanket recommendations here, but I could do that if you had a book in mind. On the LDS front, Eric Huntsman has three excellent books covering Jesus’ birth, death, and miracles; I’ve reviewed all three for T&S. Has anyone read McConkie’s Messiah series? He wrote that one of the reasons for the series was to provide updates on doctrine and other advances since JTC was written. However, from the bits and pieces I read, it looked like he also relied heavily on Farrar and was clearly not a fan of “higher criticism” (which I understand to refer to what is now mainstream academic biblical scholarship). I am curious, however, to hear from any who read the series if McConkie improves on Talmage in your view (albeit imperfectly). Also, any chance Eric Huntsman is called as an apostle and sent to the Salt Lake Temple to write _Jesus the Messiah_? JT. McConkie’s son has told me that his father relied on no scholarship that was less than 100 years old when he wrote MM because he thought they were lacking in faith. That may have been more true back in the earlier 20th century when many commentaries were more secular, but my experience (fairly wide) with commentaries and scholars of both OT and NT is that they are more faithful than they used to be, although they try to be objective in some sense. I enjoy the Mortal Messiah series and kind of wondered what the benefit of it was when it seemed (at times) to be a mere rewrite of Talmage. I think its more the doctrinal content combined with the life that he was attempting. I will say that the PreMortal Messiah is a great book for those looking for Messiah scriptures and images out of the Old Testament although its not as “scholarly” as some might like to see it. Julie–Can you email me? I have a couple of private questions? While studying church history last year I read several hundred pages from Journal of Discourses. This year as we studied the O.T. I read a lot of Antiquities of the Jews. Both these volumes had their share of stereotypical biases and inaccuracies. Yet I think I profited from reading from these texts. Jesus The Christ gives the N.T. pupil a goodly amount of pertinent historical information that helps one more fully understand the Savoir’ s ministry. And a better comprehension of the scope of the Lord’s teachings can lead to developing one’s spirituality.There is nothing wrong with a commentary but I believe this work can still stand on its own legs. Talmage’s treatment of Jews and Catholics in Jesus the Christ is similar in tone to Decker. It was passed around, highlighted, underlined and discussed by our religious book discussion group. You can giggle all you want but these people (primarily Methodists pretty mainstream) were quite put off by much of the book and viewed it as uncharitable at the very least. As to this “Where is our big publishing arm’s Truth about the Catholics” volume? Our anti-Muslim volumes? Our anti-cult volumes? Where are the LDS counter-cult ministries decrying the Satanic evils of (fill in the blank) and their power to steal our children? Where is the LDS equivalent of Jack Chick tracts?” The young men and women who knock on doors fill this roll, they have told me the “truth” about my religion and accused me of not loving my kids because I said to them, and this is a direct quote “no thank you I’m not interested”. So let me see if I understand you correctly, Nan. You visited a blog for believers of a particular religion and led out with a passionate and inaccurate and off-topic criticism, and when three commenters (must have been a slow blogging day) disagreed with you and explained why they disagreed and I indicated that your flaming attack was so off base that it was amusing, you claim to have your feelings hurt? Also wondering: since Talmage’s book seems to be important to your book group, have you considered reading and discussing the Holzapfel and Wayment commentary/update as well? I have read Farrar’s “Life of Christ” as many times as I have read “Jesus the Christ.” Both were excellent books for their day. Since “Jesus the Christ” is published by the Church, it would be a good thing if the First Presidency and Quorum of the Twelve could take it in hand and give it a good, thorough update. Elder Talmage spoke in language that was common to his day, something that is one of the book’s current disavantages. He spoke bluntly about other religions in a way that was common then, but is, as noted above, offensive today. I certainly don’t advocate political correctness, but a kinder tone would be good. If the language could be modernized both in form and temprement, and the text updated to include scholarly discoveries since Elder Tamlage’s day. I think we’d have a really good book on our hands! Just my opinion. I would be interested in knowing opinions of Alfred Edersheim’s “Life and Times of Jesus the Messiah.” Again, an old book, but I have learned greatly from all his other books. This one is a bear to get through, but for placing the New Testament into the world it came from, I am appreciating it – so far. Bruce Forbes, I haven’t read Edersheim’s book, but I have to say: I’d be just as likely to read it for insight into the NT as I would to consult a medical textbook written in 1923 for insight into that weird cough. It is hard to appreciate how much has changed in the world of biblical studies. And please note, these are not all–or even mostly–negative changes. Particularly with the literary and narrative criticism that has become prominent since ~1980, modern NT studies is often _much_ more welcoming to people of faith and productive of insights which actually enhance devotion than previous NT scholarship. This late 19th/early 20th century stuff is concerned with fighting back against issues that aren’t even on our radar anymore. If you aren’t familiar with the newer stuff, may I recommend that you read Eric Huntsman (if you want an LDS author) or Ben Witherington (if you don’t care)? I strongly believe it to be a _much_ better use of your time than 1100+ pages of out-of-date writings. Julie: I understand what you’re saying about fresh material. That’s one of the reasons I subscribe to the Biblical Archeological Review. Incredable magazine. About as fresh as you can get! The magazine has opened my eyes on many topics. When I’m teaching Old or New Testament, I am always finding things in it to share. One of the things I appreciate about Edershiem, however, is his ability to put the BIble in its historical setting. For that alone He will keep a place on my study shelf. Ben: I have read all the articles you kindly refer me to. I was asking about Edersheim because I haven’t seen him mentioned in any of those articles. Bruce, you might also try Richard Bauckham, The Jewish World Around The New Testament (Baker Academic softcover, 2010, hardcover Mohr Siebeck, 2008), which contains 24 essays on the Jewish and Second Temple roots of Jesus’ time. I think Edersheim is quite dated myself. I’ve been looking for this book ever since I did an audio recording of Jesus the Christ for a fellow missionary and later as a podcast on iTunes. Holzapfel and Wayment edited three volumes of essays, titled “The Life and Teachings of Jesus Christ”. Because it is a collection of essays, it lacks the cohesion that JTC has and isn’t a suitable replacement. Like JT in #20, I think it would be cool if the Church would call someone to write a single volume that could replace JTC in the Missionary Library. So the style of that hundred-year-old book wasn’t so outdated that it couldn’t help a wayward rock star find his way back into the fold.